Bathroom in our crazy paced life became much more than a room for hygienic needs but a place to recharge one’s mental batteries as well as getting ready for new day. Depending on personal needs, some people envision their perfect bathroom more as SPA territory with its tranquility and relax vibes while others like to keep its interior bright and energetic. Whatever style needed, modern design instruments make it possible. In any stylistic scheme small details are the ones that make big difference. Decorative mirrors for bathroom can become this missing element of a puzzle which makes a whole interior look very complete and put-together. 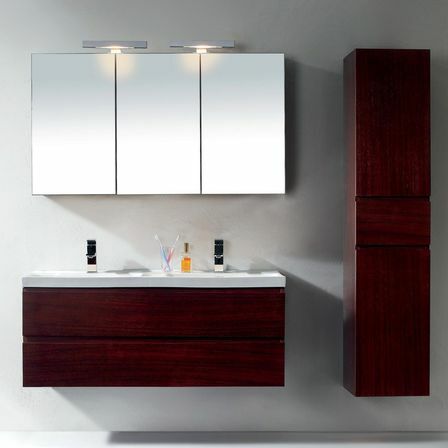 Bathroom mirror, being inevitable element of any bathroom, can act as key element of its interior. Nowadays you can find in special interior shops mirrors of various shapes, sizes and designs. 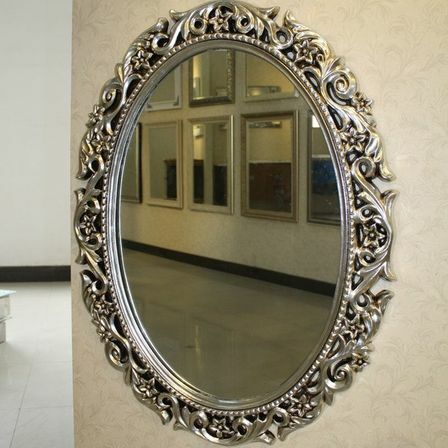 There are also possibilities to order unique mirror, in tandem with experienced designer materializing even vague fantasies and ideas of client. Decorative bathroom mirrors can be of great use in case you want to freshen up looks of the room without remodeling its basis. In case of creating brand new interior or serious remodeling it makes sense to choose decorative mirrors right from the start of sketching project. You should decide on wanted size and design of mirror. Why is it so important? You may want to decorate bathroom walls with built-in mirror surface or mirrored decorative elements. Buying in advance one of key figures for future bathroom interior, you can plan other décor elements around it and calculate all materials needed which would spare your money, time and energy. 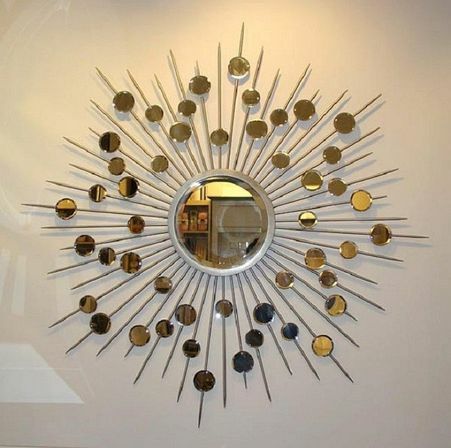 If you decide to order unique decorative mirror, it also would take a while. In bathrooms of quite modest size it is important to prevent mirror from looking too big and overwhelming in the whole interior concept. One way is to choose several small unusually designed mirrors for creating a kind of mirror ensemble. 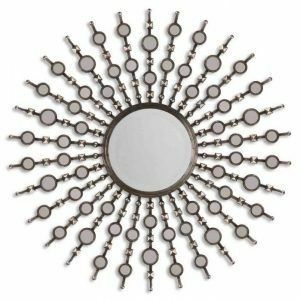 Or, in case of choosing a rather big decorative mirror, it is best to make this mirror main interior accent and to build the whole interior concept around it. Along with being of different shapes, modern bathroom mirrors can be equipped by such useful facilities as moving mechanisms and built-in anti-fog heating pads. Decorative mirrors for bathrooms can come in various forms. Decorative bathroom mirrors can be based on different bathroom mirror types, such as wall bathroom mirrors, bathroom mirrors with shelves, bathroom mirror cabinets, lighted bathroom mirror and others. One of approaches is based on decorating mirror surface itself. Decorative bathroom mirrors can be made out of tinted glass. There is a wide color spectrum of tinted mirrors. Blue, graphite, copper, green and golden shades form incomplete list of colored mirrors. If you like the effect which gives colored glass but don’t want it to be permanent, LED lighted mirror with switchable different color regimes might be a good alternative. By switching the tumbler mirror can go from cobalt blue to regular transparent colored in one second which allows combining practical versatile mirror with extravagant colored mirror in one item. Yet another interesting variation is purposely distressed mirror surface. On the basis of such tinted distressed mirror for example an antique Italian interior can be created. 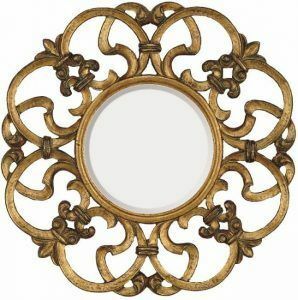 In antique and classic interiors genuine antique mirrors or purposely distressed ones would look appropriate. New technologies allow making brand new mirrors which look straight out of museum. There is a new interesting distressing technique, when surface has 3D reflection. All these styling methods make sure that reflective quality of mirrors stay at high level. For manufacturing such models resin is used; due to natural characteristic of this material such designers’ mirrors would serve eternally. 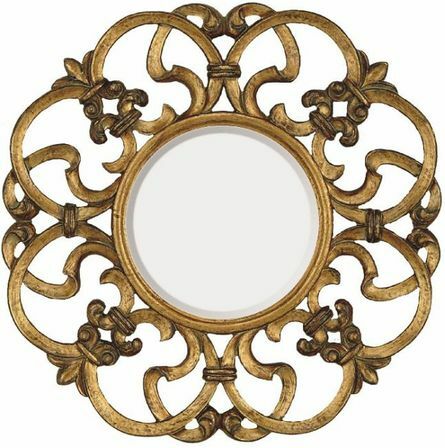 Classic oval framed mirrors from antique store can cost fortune. Luckily, modern technologies make it possible to create very true looking replicas out of plastic. Plastic picture molding are widely used for classic bathroom interiors, being affordable and looking so good that some items can be mistaken for real works of art from older periods. Plastic and new technologies leave almost unlimited field for designers’ fantasy. 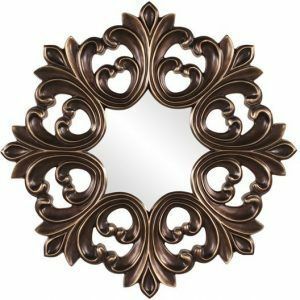 Along with classical golden, silver or natural wooden shades, replicated decorative mirrors of an old era, any coating can be used. 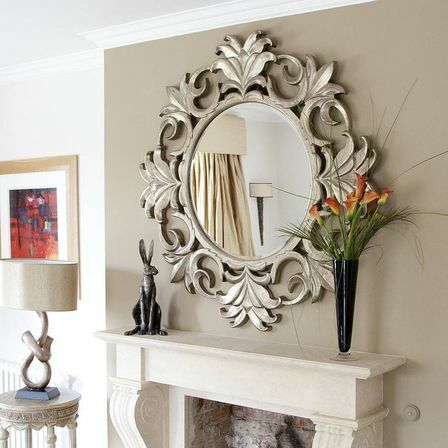 For example, such classic frame with lots of décor, can be coated in matt monochrome enamel. Such decorative bathroom wall mirrors, painted in contrast colors, as black or blue can create interesting bathroom interiors in fusion styles, mixing different styles on the territory of one room. Sandblasting technology allows creating fascinating interior elements. Modern furniture, decorated by using this method, is considered to be unique and attractive. 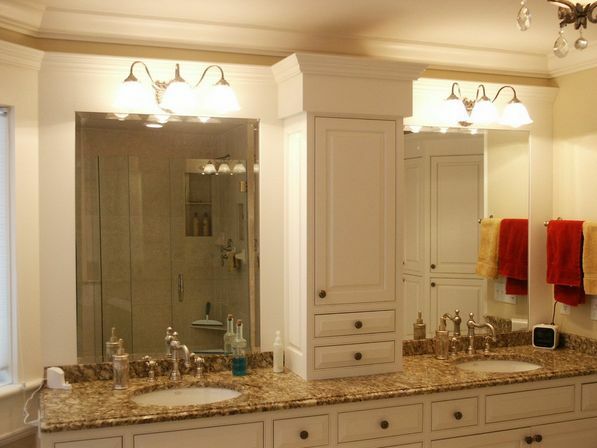 This technology is successfully used for creating wide range of decorative bathroom mirrors. This unique technology allows getting fine elegant high quality images on the surface of decorative bathroom mirror. Themes of images vary from oriental ornaments to images of fruits and animals and it is limited only by artist’s fantasy. Cost of ready mirror would depend on size of sandblasted surface and on complexity of design. 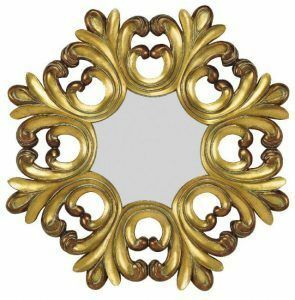 These decorative mirrors would look great in any contemporary bathroom interior; they do not require special interior styles. Such a mirror can play it solo and can be that very detail that transforms boring standard bathroom into cute individual room. Decorative film is truly the most budget and simple design solution. It doesn’t cost much, it is really easy to use and can turn regular mirror into decorative mirror momentarily. Decorative film can imitate sandblasting image, geometrical ornament, stained-glass, photo collage and colored images. High technologies are also used for decorative purposes. For lovers of the most modern and progressive gadgets mirror manufacturers have developed such interesting modifications as mirror with TV and mirror with digital clock and thermometer. There are also some miracle-looking decorative mirrors with designer’s lights. 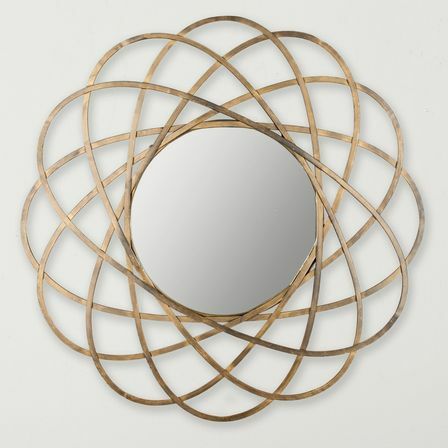 These decorative bathroom mirrors are perfect for high-tech interiors. Processing of mirror’s edges can as well give it a noble look. After mirror’s been cut, its edges are to be processed. Edges can have matt or glossy finish. 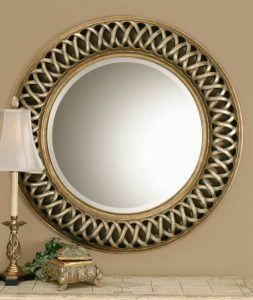 Bevel processing gives a mirror complete and elegant look; mirrors with processed edges can become a decent alternative to framed mirrors, given that they fit in any interior and color schemes, unlike framed ones. 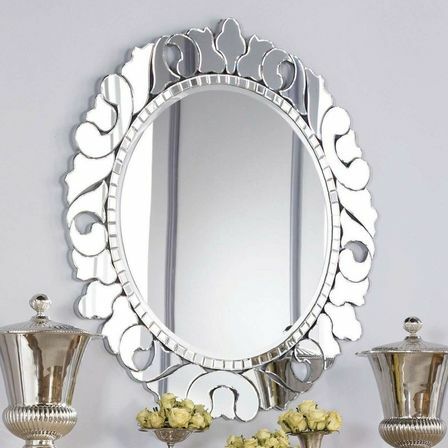 Such mirrors are widely used in hi-tech interiors. 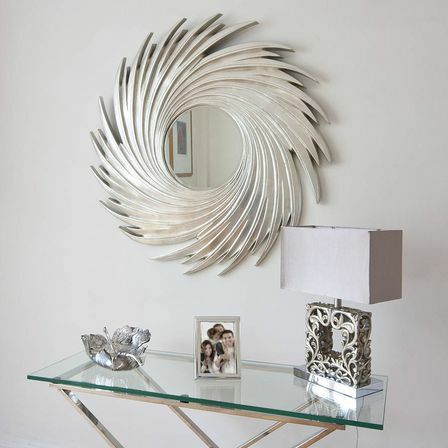 It is also possible to create your own unique-designed decorative mirror. In special hobby stores are sold rhinestones, decorative elements and special glue – with help of these materials and fantasy you can decorate plain mirror.